Menash is a type 1 diabetic (previously known as juvenile), meaning his pancreas doesn’t work properly, and is unable to produce the insulin required to turn glucose into energy. He was diagnosed with the chronic condition almost 30 years ago, and since then has had to inject himself with artificial insulin four times a day. Every day. It turned out that Menash had accidentally given himself double the ordinary dose of insulin. This is a very easy mistake to make, albeit one with potentially serious consequences. 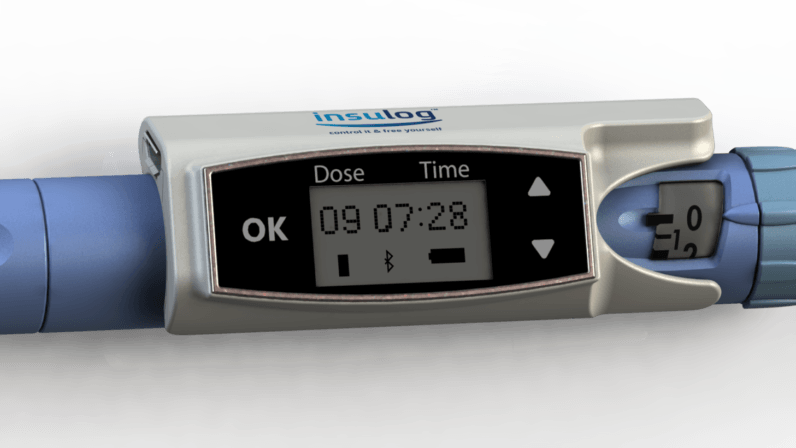 This device clips on to the end of any standard disposable insulin injection pen and automatically records whenever the user adjusts their insulin dose, or injects themselves. This is then displayed prominently on the device’s LCD display, making it harder for someone to inadvertently double-dose themselves. The device comes with a built-in battery, which lasts up to six days, and can be recharged via MicroUSB. It also boasts Bluetooth connectivity allowing users to automatically synchronize their injection data with their iOS or Android smartphone, which can be later shared with their physician to help them manage their diabetes. The Insulog is being launched on IndieGogo today and backers can get their hands on an Insulog for just $119. Menash has retail dreams for the Insulog. “I want people to be able to pick one up at the pharmacy, along with their insulin,” he told me. And if it ever reaches that point, he expects that it’ll retail for $199.